Some of the most exciting moments in marathon racing have happened in Chicago. Not sure why Chicago. Maybe it's because the Chicago Marathon has the financial means to lure big talent with borderline crazy fearlessness—the ingredients of epic races. Maybe, it's because Chicago's infamous weather adds an extra brick to the already heavy burden of 26.2 miles. Or because the last mile, over the railroad tracks (a bump that might as well be a mountain at that point) and down the longer-than-it-seems quarter-mile stretch to the finish, is the coup de gras to the soul-suckingly bleak factory-strewn second half. Here's a short compilation of some Windy City bareknuckled action. Thirty years ago, Welsh jet mechanic Steve Jones toed the start line alongside the two favorites, Olympic gold medalist Carlos Lopes and World Champion Rob de Castella. Jones had never run a marathon, though he had a reputation as a tough and feisty track runner. Nonetheless he blasted from the gun at a pace that had observers and no doubt other competitors rolling their eyes. He wasn't wearing a watch but said he monitored his pace by comparison to Lopes and de Castella—"If I was with them, I was going quick. If I was ahead of them I was going quicker." Things to note about the clip below: It's raining and windy ( a death knell for a world record these days), they're running next to a highway (course was different than the current one) and, though Jones is well ahead of the two favorites on world record pace in the last mile of the race, the announcers still discount him, ignore him and get his name wrong, making the joke that "all those Brits are Smiths or Jones." In his first marathon, Jones ground out a world record 2:08:05 in the rain with no pacers, running most of the race by himself. 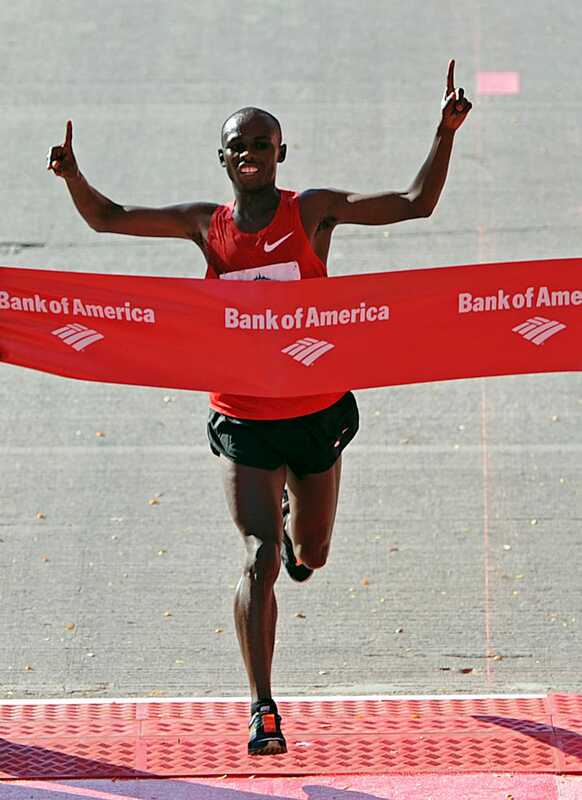 In 2010, another warm day by marathon standards, Kenyan sensation Sammy Wanjiru was defending his title at Chicago against Ethiopia's Tsegaye Kebede. Wanjiru broke the world half-marathon record at the age of 18, and in 2008, became the first Kenyan to win an Olympic gold medal in the marathon, but he was not in shape when he stepped to the line in Chicago: Injuries and his hard-partying celebrity lifestyle had interrupted his training. Most thought his presence at the start was a formality, and that he'd be dispatched early in the race. Instead, the final miles turned into one of the greatest mano-a-mano battles ever. As a post-script, Wanjiru died a year later of a fall from the balcony of his home in Kenya. He was 24 years old. It's still not known whether it was an accident, homicide or suicide. Not sure whether to go for a run or have some chips and watch this again.